In the heat of the summer afternoon, I can be spotted sitting in a deck chair in the sun, my nose buried in the pages of a good book. For someone who is eternally chilled, the oppressive heat is dreamy; I wish I could bottle up the feeling for another season. By far, this form of relaxation is my favorite summer activity, and I look forward to it greatly each year. This is my spa day, my indulgence, my unique form of pampering. If only these days could last forever. When the heat grows suffocating, I reluctantly head back indoors to cool off. Since it is one of the rare times the air conditioner feels welcoming against my skin, it would be a sin to turn on the oven to bake. Ultimately, this reasoning is how this sorbet came about. While rhubarb seems to be a fleeting spring trend in the food world, the Upper Midwest enjoys this vegetable all summer long. As a wonderful contrast against the sweetness of summer fruit, the tart rhubarb complements summer fruits and berries well. In this sorbet, rhubarb is paired with raspberry to produce a very brightly colored, flavorful dessert. Feel free to use fresh or frozen fruit—I have done so with both and it has turned out equally well. The sorbet stays soft due to the use of honey as a sweetener. Honey does not contain enough water to freeze (it is a supersaturated sugar solution) and so it prevents the sorbet from freezing hard like other chilled desserts. While this sorbet is not ideal for ice cream cones, one of the benefits of the soft freeze is that the sorbet becomes an excellent base for cocktails. Simply add a scoop or two of sorbet, a shot of vodka, and top it off with a fizzy soda (such as lemon-lime or gingerale) for a sweet summer drink. 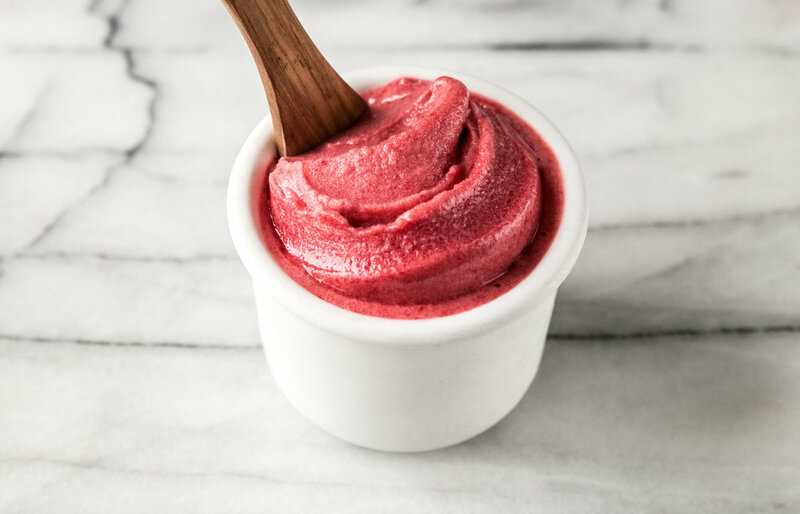 Raspberry Rhubarb Sorbet is ideal for celebrating the summer months because it requires so few ingredients. Raspberries and rhubarb are boiled down into a sweet sauce and frozen into a soft sorbet. Honey is used as a natural sweetener, and it complements the fruit flavors well. While I suggest a full cup of honey, you can use less if you prefer a more tart sorbet. Simply taste as you go, and you will find your ideal sweetness. In a large saucepan, combine rhubarb, raspberries, water, and honey and bring to a boil over medium high heat. Lower the heat, and simmer for 10-15 minutes, or until the rhubarb is soft and translucent. Remove from heat and stir in vanilla extract. Allow mixture to cool for 10-15 minutes before transferring to a blender or food processor. Process until smooth. Run mixture through a fine mesh sieve to remove seeds and fibers. Discard solids. Chill for 3-4 hours, or until cold. Freeze mixture in ice cream maker, following the manufacturer's instructions. Transfer sorbet to an airtight container and freeze for 4-6 hours before serving. The sorbet will keep well for 2 weeks in the freezer.